True global coverage of world history encourages students to recognize historical patterns and to think critically about pictorial evidence. Chapters highlight characteristics of the major civilizations, and students focus on historical patterns of trade and exchange within and among major societies. 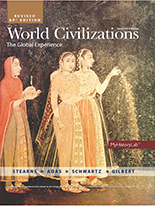 Revised Edition, 7e ©2017 has been update to include a Key Concept correlation for the College Board’s New Curriculum Framework for AP® World History effective 2016–2017. End-of-chapter questions have been revised to align to the new framework outline. NEW! AP Exam Style Test Bank available online. 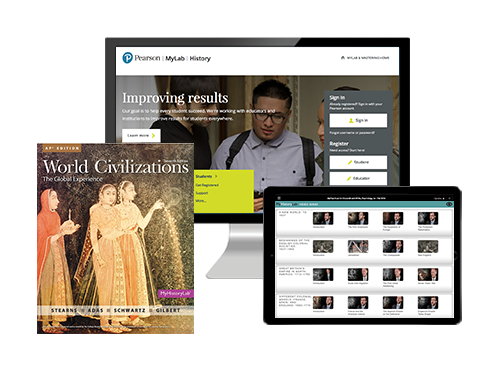 Multi-year access to MyHistoryLab with Pearson eText provided upon textbook adoption. See description on page 1.